Whoever said that Hollywood has no heart was simply dead wrong. They just didn't know where to look. 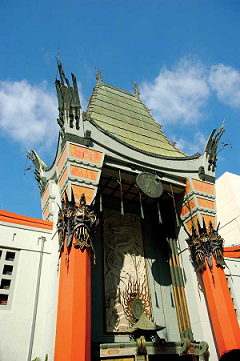 Hollywood's heart can be found at 6925 Hollywood Boulevard, sandwiched between the towering Kodak theater, home to the celeb-swarmed Oscars, and Madame Tussauds, where hot stars become cold wax. Here at the Grauman's Chinese Theatre—that iconic, oversized, pagoda-style movie house—the energy of classic and modern Hollywood coalesces to bring celluloid to life. Tourists snap photos of the giant Heaven Dog statues—curly, carved beasts inspired by the Tang Dynasty sculptures—who guard the grand entrance to the theater. Kids sprawl across the entryway, some placing their hands in the prints of Hollywood greats like Marilyn Monroe, Denzel Washington and John Wayne, while others try to match the "foot" prints of Star Wars droids R2-D2 and C-3PO. The smell of street vendors roasting bacon-wrapped hotdogs, LA's official snack, permeates the air while rogue costumed characters—Superman, Wonder Woman, Hulk, Mr. Incredible-wearing homemade suits pose for photos with tourists. After a few Batman-on-Batman brawls, the city banned these out-of-work, wannabe stars from taking over the theater, but the new law doesn't stop an improvised Iron Man from hailing some wide-eyed youngsters. "Are you a robot?" one young boy in a Spider-Man shirt asks Tony Stark. Iron Man silently activates a light in his armor and the boy's jaw drops. The theater's massive red towers and curved pine-green roof are impressive by any standards, but on opening day on May 19, 1927, no theater in the country topped it. Owner Sid Grauman designed the Chinese to be his crown jewel. He'd already overseen the construction of the Million Dollar Theatre in downtown Los Angeles and the Egyptian Theatre, just a five-minute walk from the future site of the Chinese, and spared no expense to create this opulent temple to cinema. Priced at $2 million—$24.5 million in today's dollars—the theater flaunted actual artifacts from China at a time when the ocean voyage across took more than three months. Millions of tourists stop by the Chinese every year, and millions more witness its image captured in posh movie premieres and feature film cameos. But nothing can replace the feeling of being there, in that place where Steve McQueen scrawled "Thanks!!" in the wet cement, where Frank Sinatra once posed for fan photos and the cast of Star Trek beamed up to pop culture history. Today, grand movie houses are a rarity. But at Grauman's Chinese Theatre, the popcorn is still hot, the sodas are still cold and the house is still packed. THEATER TOURS Tours are offered every half hour, seven days a week excluding special events. Please call for up-to-date availability (323) 463-9576. Group rates are available. FOOTPRINTS YOU'LL SEE > There are nearly 200 Hollywood celebrity handprints, footprints, and autographs in the concrete of the theater's forecourt. The latest stars to be immortalized are Will Smith, Michael Caine, Hugh Jackman and Robert Downey, Jr.
CHEAP HOLLYWOOD EATS > With succulent hot dogs, fresh-squeezed lemonade and hand-cut fries at prices that are easy on the wallet, punk rock stand Skooby's Hot Dogs offers welcome sustenance after a long day hoofing the Walk of Fame. 6654 Hollywood Blvd. CLASSY HOLLYWOOD DRINKS > If Hollywood glam just isn't your style, walk east to where the classic Cahuenga corridor offers a cool refuge from blinged-out clubs. Check out the ‘50s salon-turned-cocktail lounge Beauty Bar or the art deco revival Bar Delux. 1638 N. Cahuenga and 1624 N. Cahuenga. HOLLYWOOD SOUNDS > Take a healthy stroll south to Los Angeles' largest music store, Amoeba Records. Lose yourself in a sea of vintage vinyl, hot new releases and an expansive movie catalog. 6400 W. Sunset Blvd. BREAKING NEWS: U.D. District Judge Dean Pregerson has just ruled that costumed characters will be allowed back on the streets in time for the Thanksgiving holidays. Wrote the judge, "Although costumed performance may not be a traditional form of speech, it is without doubt a protected one." Following this summer's ban, over two dozen costumed superheros have been arrested.